For the last 27 years Okeechobee has not had one death of a senior on graduation night and that is largely because of Grad Night. The community of Okeechobee has united once again to offer our best wishes to our high school graduates by hosting the annual all-night Grad Night celebration on June 4th 2016. The celebration is open to all Okeechobee graduating seniors and one pre-approved guest of their choice. Grad Night is organized by a local committee and supported by: the Kiwanis Club of Okeechobee, Okeechobee Rotary Club, and many other local businesses. 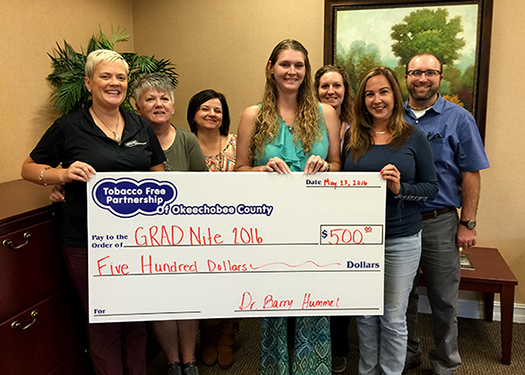 The Tobacco Free Partnership of Okeechobee County was honored to help sponsor this year's event, which creates a drug-and-alcohol free event for local high school graduates. Grad Night begins one hour after the high school graduation ceremony ends. This year’s event is being held at Chobee Skate and Play. Graduating seniors attend the event with a pre-approved guest of the choice. Upon arrival each student is checked in and given a wristband, the students are not permitted outside of the building during the entire event, and they are not permitted to return to the event once they leave. By not allowing the students to leave and return, and not allowing the students to obtain their prizes until the next morning it encourages the youth to stay the entire time of the event. During Grad Night the students are fed meals, play games all night in which they win tickets for prizes at the end of the event. The event is over at 5am the following morning, at which time the ticket can be redeemed for over ten thousand dollars’ worth of prizes, 2 scholarships to IRSC and one cash prize of $1,500 provided by the Brighton Seminole Tribe. Tobacco Free Partnership of Okeechobee is honored to sponsor this event for the third year in a row and are committed to making a positive difference in the lives of our Okeechobee Youth. For more information on the work of the Tobacco Free Partnership, or to become a member, please contact Courtney Moyett at: cmoyett@quitdoc.com, or visit www.tfp-okeechobee.org.